Emma is at that age right now, where naps are not a daily occurrence. And now that she and Mary share a room, it is even harder to get both of them napping at the same time. Emma chooses to sing and chat herself to sleep, while Mary just pops her special sucking spot, right at the lower thumb knuckle, into her mouth and lulls herself into dream world. So, the combination doesn’t work well when both techniques are going on in the same room. So, Emma’s been allowed to skip naps lately while Mary and Elizabeth snooze away. 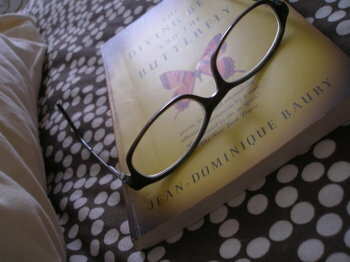 The downside is that I miss that alone time in the afternoons. But the up side is that Emma and I often get some time to ourselves (and bedtime is usually a whole lot easier). Today, I’m fighting a nasty little cold, so I attempted to sneak in a little nap and reading too, while she worked with playdough around the corner at the kitchen table. She’s happily making a "special barrette holder for a special friend". 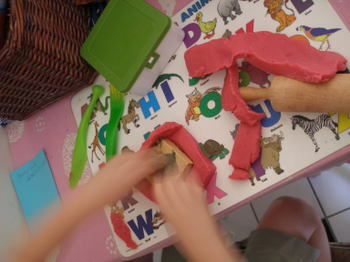 I’m often amazed at the things she creates with playdough. She is so good at coming up with original ideas on her own. For instance I love these little "pebbles" she placed around the outside of this dish. It’s so creative and it’s her own idea. I, on the other hand, am usually just the opposite. I’m inspired by things I see in nature, in print, in other people’s art, and then I find a way to make that my own. Is that copying? or can I just chalk it up to inspiration, because that’s what I really believe it is. 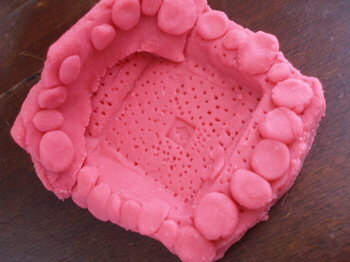 Meanwhile, I may have to "copy" this little idea off of my five year-old the next time I break out my clay. And soon, I think she might just have to graduate up to the good clay too. Some of these creations need to be saved in something other than a medium that dissolves in water. So thanks for the inspiration Emma. One never knows where it might just show up. Sleep tight! And I’ve often felt that clay is just playdough for grown-ups! so sweet! hope you got some sleep molly! Hope you got in a good nap! My 7 yr old is really into clay the past two years at school and I really wish I could send her over to your place one afternoon while you are working away in your pottery studio so she could study what you are doing to learn a little bit more (I know nothing of these things). Hubby was looked into getting a kiln for her but the cost is way over our budget. Sure wish I could teach her how to make something that doesn’t have to be in a kiln. It’s her 8th birthday in a month so I want to get her a tool set for clay cutting and accenting. My girl isn’t even three yet and she has already dropped the naps. I don’t think she has had a day time sleep for 6 months now. Let me tell you, I get really tired, especially with my new one keeping me up at night! I miss that quiet time in the day.I also wanted to ask you about your two in the same room. Does that mean when one is asleep in there, the other one can’t go in? Where do you keep the toys?